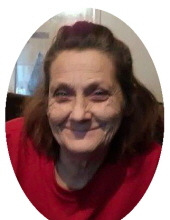 Sandra Kay Spencer Utterback, age 59, of N. Queen Street, Mt. Sterling, passed away Friday, February 1, 2019, at St. Joseph Hospital in Lexington. She was born September 23, 1958, in Mt. Sterling, a daughter of Hazel Marie Eldridge of Mt. Sterling and the late Edward Clay Spencer. In addition to her father, she was preceded in death by a sister, Loretta Mae Spencer Williamson. Besides her mother, Sandra is survived by two sons, Robert Lee Spencer of Montgomery County and Christopher Joe Utterback of Stanton; four sisters, Elsie Spencer of Morehead, Wanda Jones, Edna Caudill, and Bobbie Stockdale, all of Mt. Sterling; one brother, Edward Spencer of Mt. Sterling; and numerous nieces, nephews, and extended family. In addition to being a homemaker, Sandra enjoyed crocheting and spoiling her dogs, Georgie and Bit-Bit. To send flowers or a remembrance gift to the family of Sandra Kay Spencer Utterback, please visit our Tribute Store. "Email Address" would like to share the life celebration of Sandra Kay Spencer Utterback. Click on the "link" to go to share a favorite memory or leave a condolence message for the family.